Collective Bargaining Director Steve Kreisberg. Gov. 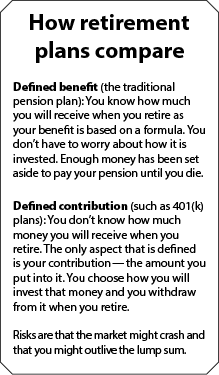 Jay Inslee has no interest in moving to defined contribution plans, but “you never know what could happen,” Kreisberg added. Among the moves being mooted by the authorities is to have new employees start with a defined contribution plan, rather than a pension. But such a move will still have a big impact on existing employees, Kreisberg explained. The reason: The new employees would not be paying into the pension system, reducing the funds available to fund pensions. Defined benefit coverage has fallen at the same rate as union membership has declined, Kreisberg added (see accompanying graph). The result is leading to impoverishment in retirement.